My wife, Heidi Leppert, and I had a blast in the Caribbean as Viking Ocean Cruises’ Viking Star explored the region for the first time, so in our usual fun way, we present a “he said, she said” review of our time in the tropical destination here. He said: One of the greatest things about revisiting the Caribbean, a destination I’ve sailed to dozens of times before, was the opportunity to check out several islands that were entirely new to me. The Viking Star is a smaller 930-guest ship that can dock at more unique ports well away from the mega ships. 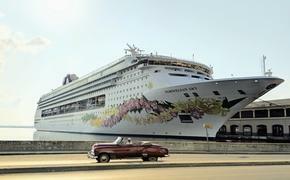 In fact, we were pleasantly surprised to be the only vessel in town on most days, only meeting up with others in Puerto Rico, where we delightfully strolled passed hundreds of guests re-boarding a Carnival Cruise Line ship to hop on ours with zero wait. She said: I too have visited the Caribbean, though not as much as Jason, but I was excited to see how Viking did things differently. We decided to do a mixture of included tours and paid tours to get an idea of everything Viking has to offer. One standout for me was how well everything was organized. It was always very easy to find our tour group, and there was never any wait to get underway. Get off the ship, meet our guide, and Viking was always ready nearly immediately to board our bus/catamaran/safari vehicle. One nice touch was the crew member handing out free cold bottles of water as we exited the ship in every port. He said: The real treat was making it to gems like Jost Van Dyke, British Virgin Islands via Road Town, Tortola and Basseterre, St. Kitts; decidedly our favorites along the roundtrip route from San Juan. 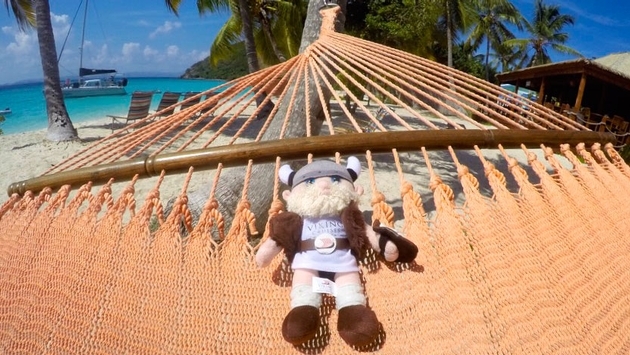 We particularly enjoyed taking our plush Viking Erik traveling companion along with us to playfully pose in several scenes along the way (as pictured above). We only wish now that we had purchased a bottle of delicious rum punch from Mount Gay Rum in Barbados to take home with us. Thankfully, there’s always next time! She said: In Tortola, we had booked the tour to Virgin Gorda & The Baths, which was sadly canceled due to low participation. We decided to book the Escape to Jost Van Dyke tour in its place, and we’re so glad we did! We took a catamaran to the secluded White Bay, about a 45 minute ride. Then we descended the steps off the front of the boat into some of the most picturesque Caribbean water I’ve ever seen. The bay is home to the famous Soggy Dollar Bar, which is known for inventing the Painkiller cocktail. We had the most perfect afternoon of relaxing in the water and testing out the Painkiller (for research, naturally). And Jason even spent some time in one of the hammocks available for use (also pictured above). We would do this excursion again in a heartbeat. He said: As great as most ports were like Bridgetown in Barbados, there was one that was a bit of a dud: Pointe-a-Pitre, Guadeloupe. Viking is wonderful to provide a free shore excursion in every port as part of its all-inclusive value, and we were at first excited to take an extensive five hour one here complimentarily. Alas, it disappointed beyond highlights of the UNESCO World Biosphere Reserve of Guadeloupe National Park and its rainforest waterfall as well as the dramatic Castle Point beach rock formation. Suffice it to say, it’s not pleasant to have a guide ramble on over the bus PA non-stop for five hours straight without taking a single breath nor forgo a bathroom break until the very end of the tour, but I’m sure Heidi will have some more to add. She said: Apparently I drew the short straw and am writing about Guadeloupe! I’ll start off with the good. I know that Viking listens to their guests, so I would imagine they will be making changes to this particular excursion soon. But if the excursion stays the same for now, I would be remiss if I didn’t warn you to either stay on the ship that day or book a paid tour. Unless you are currently writing your dissertation on the process of sugar cane harvesting or all the ways you can cook a breadfruit, I can’t imagine anyone would want to listen to 5 hours of really boring facts about the island. Now, we may have just been unlucky with our particular tour guide, but overall I would describe this tour as too much driving and not enough sightseeing. Crayfish Falls was okay, but I grew up near Yosemite so my waterfall standards are pretty high. Castle Point was fantastic and the one saving grace of the tour. But going nearly 5 hours without a bathroom break is simply not acceptable. Our tour even got stuck behind a funeral processional, making it stretch out to nearly 6 hours and making us late back to the ship, but Viking did an excellent job of lifting our moods with trays of free champagne and juice accompanied by upbeat music and a tunnel of smiling Viking crew clapping, dancing and welcoming us back to the ship. He said: Truly, the remainder of the complimentary tours were very enjoyable, even if they were mostly island overviews. We’d definitely recommend also reserving the occasional optional excursion as well to take a deeper dive. (She said: I overheard one passenger mention she booked the included tour first thing in the morning, and then did a paid tour later in the day. Great strategy!) Our open-air transport through St. Kitts led us to immediately fall in love with the island and want to return. There we discovered an island not unlike one rich in foliage like Hawaii but alluring with its own mysterious ruins, always a favorite of mine, and dramatic landscape. She said: And isn’t that one of the wonderful things about travel? The discovery of new places that touch your heart and make you want to return. That was St. Kitts for us. We took a paid tour called Safari Island Drive, and it was the highlight of our cruise. Our tour guide was very colorful – literally. He was dressed from head to toe in the island’s famous Batik fabrics and even had a rainbow colored beard. He drove us in an open air vehicle with about 12 other passengers, and the drive was peppered with interesting facts about the island, along with enough silence to take in the sights and enjoy the beauty. We stopped at many places perfect for photo ops, our favorite being Black Rocks. Partway through our drive, we learned that the gentleman sitting in front of us was 94 years old, and I could tell he was having a great time. It really is a testament to Viking to have curated a tour that appeals to the explorer in all of us, whether we are in our 30s or 90s.